a gallery of Irish snapshot and vernacular photography. 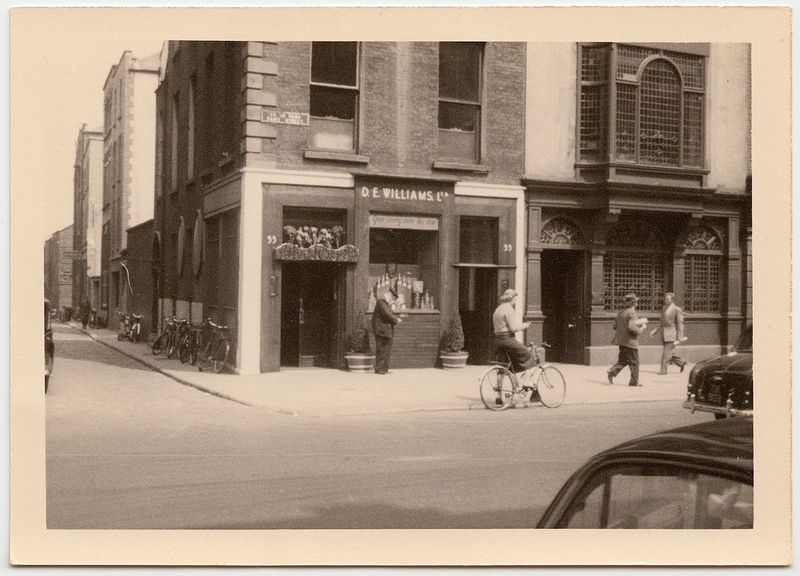 This small snapshot was taken in 1957 and it is captioned on the back as a ‘Dublin liquor store.’ It shows numbers 52 and 53 Dame Street and the side street called Temple Lane South. Although it includes two Georgian buildings, the image is decidedly modern in its composition and atmosphere. Two cars can be seen moving out of the shot, three hat-wearing men are ambling down the street, one with a parcel under his arm. A female cyclist wearing a fashionably tight skirt and knitted sweater has stopped by the path. Bicycles are lined up against the side wall of number 53 on Temple Lane South. Perhaps the modern feel is heightened by the fact that the front of No. 53 (the headquarters of the wine and spirit distributor, D.E. Williams) was designed by the modernist architecture Michael Scott. When first opened, it was described by The Irish Times on the 16th of August 1941 as being ‘carried out in teak’ and as ‘a notable example of simplicity and elegance in design.’ By 1957 the exterior is pretty much unchanged excepting for the addition of an incongruous curved wooden flower box over the door. You can click on the above image to see a larger version of the snapshot. The window display bears the slogan ‘Give Every Man his Dew.’ This refers to the whiskey Tullamore Dew which takes its name from the initials of the distributor D.E. Williams. An article, dating from 1954, on the history of the company can be found here. Now an Italian restaurant called Nico’s (one of the oldest Italian restaurants in the city) which first opened in 1963. It is mentioned in this piece from the Dublin blog ‘Come Here to Me’ that also includes a really nice photograph of the building taken in recent years. This review also references the restaurant’s history. The next building, No. 52, was occupied by several legal firms. Street directories also give home addresses for the ‘legal eagles’ that were mainly in affluent parts of South county Dublin and Wicklow: John K. Lloyd-Blood, commissioner for oaths, home address Glencot House, Kilmacnogue, County Wickow; Gwynne Stirling, residence Marino Lodge, Killiney; Raymond French, solicitor, Knocksinna House, Stillorgan Road. Number 52 is now a hair and beauty salon called Preen. It has not been altered too much since this photograph was taken. It now has two doors instead of one, however, the latticed windows have been retained on the upper storey. The ground floor and basement recently sold for 661,000 Euros to an overseas investor. As stated above the print is small (3 inches x 4 inches). A stamp on the back includes the Minox logo stating that it is an original Minox print with the date of June 11-1957. Minox cameras were produced in Latvia and after the Second World War in West Germany. They were a desirable luxury item that was widely advertised in Europe and America. The firm was also known for a particular sub-miniature camera favoured by spies. The snapshot is printed on Leonar paper, one of the most popular papers in post-war Europe. You can read a history of the firm with particular reference to their Leigrano paper here. The use of the phrase ‘liquor store’ suggests that this photograph was taken by an American. One who could afford to travel and purchase a Minox camera. It is amazing the tangents that a single snapshot can take you on: from a Michael Scott designed shop-front to whiskey labels and spy cameras. I was delighted to write a piece for the Gallery of Photography’s current project and exhibition The Photo Album of Ireland. The exhibition was opened last Friday by Professor Diarmaid Ferriter and it explores the history of photography in Ireland through the family album. It runs at the Dublin gallery until the 31st August and you can also view the publicly sourced photographs at the project website here. The following text and image appear in the exhibition and relate to a photograph from my own family’s collection. It tells the story of female emigration from Ireland to the United States and also explores the role photography plays in the construction of family narratives. I collect photographs and write about them on my blog. Most of the people in these photographs are anonymous and will remain so. Sourced from online auctions, charity shops and even skips, the images have become separated from the families who once valued them. I look for interesting faces, extreme fashions and unusual formats or studios. I then research and write short pieces which I hope illuminate a moment in Irish social, photographic or fashion history. Naturally, I know and understand my own family photographs in a different way to those that I write about on my blog or within an academic context. Their value comes from the telling and re-telling of stories which transform sometimes unremarkable images into something special. Would I buy these photographs if offered for auction on eBay? Probably not! But they do mean a great deal to me. My love of photographs started with my grandmother, Roseanne, whose mother is shown in the above image. No visit was complete without a thorough examination of the box of photographs which she ceremoniously brought down from the ‘upper room’. An act which intensely annoyed my grandfather who declared that ‘no-one wants to look at that old rubbish.’ She ignored him and commenced her guided tour. She held each photograph, dictated the viewing order and seldom deviated from her script. Mingled amongst the images of her daughters at dinner dances and snapshots of haymaking were the American photos sent across the Atlantic by a previous generation of emigrants. Different in format, they included tintypes and photobooth pictures, neither of which were prevalent in Ireland. The American photos felt and looked different to Irish photographs. 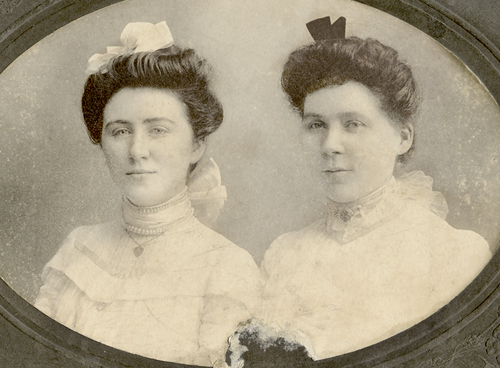 One such example, is this photograph of my great-grandmother Susan Smith and her cousin, taken not in her native Cavan, but in the Massachusetts city of Brockton. It is the only evidence of the ten years that she spent in America between 1895 and 1905. We hear little of Brockton now but during the time that my great-grandmother lived there it claimed to offer the highest industrial wage in the world at $3.75 per day. At one stage ‘shoe city’ had over 100 factories and it was booming. Put into an historical context my great-grandmother’s tale was typical of Irish emigration during the period. More single women than men left. Some stayed forever. Some like Susan Smith emigrated for substantial periods of time, in her case ten years, during which she earned enough to provide herself with a dowry. This and her husband-to-be’s earnings as a copper miner in Arizona allowed them to buy a house and farm upon their return. My great-grandmother’s tale, mirrors that related by Diane Dunnigan in A South Roscommon Emigrant: Emigration and Return, 1890–1920 (2), in which she tells how these independent women worked, saved and sometimes returned to Ireland bringing with them different life experiences. When my great-grandmother and her American cousin entered the studio of D.T. Burrell at 68 Main Street, Brockton, they commissioned an image which adhered to the well-established conventions of studio portraiture. They wear their ‘Sunday best’ of fashionable lace high-necked blouses and choker necklaces. They have piled their hair into ‘Gibson Girl’ pompadours so prevalent during the period. 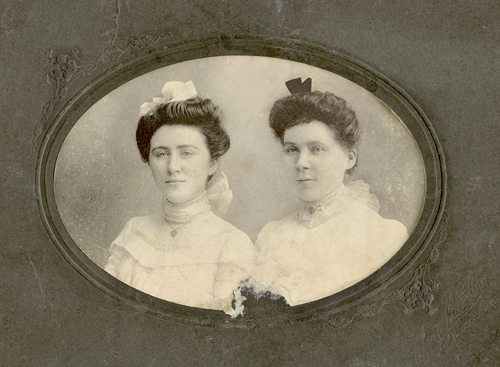 Presented in cameo upon embossed paper, the two young women stare confidently at the camera. Her cousins, Mary, Kate and Rosalie were the American-born children of Cavan parents who had emigrated in the 1880s. Like them they worked in shoe factories, however, they had advanced from manual positions to jobs as clerks and stenographers. When my grandmother talked about this photograph she was not considering emigration trends nor the role of the returned Yank. Instead she used it as a vehicle to discuss a very personal event: the death of her father less than ten years after his return to Ireland. Although not included in the photo, he was the focus when this portrait was examined. The story of her parents’ hopeful return to Ireland starts with this image. His premature death from silicosis, the result of his work in copper mines, was naturally a major blow to his only child and this photograph allowed her to raise the subject sixty or more years after the event. (1) Dunnigan, Diane, A South Roscommon Emigrant: Emigration and Return, 1890-1920, Dublin: Four Courts Press, 2007. (2) Miller, Daniel, The Comfort of Things, Cambridge: Polity, 2008. 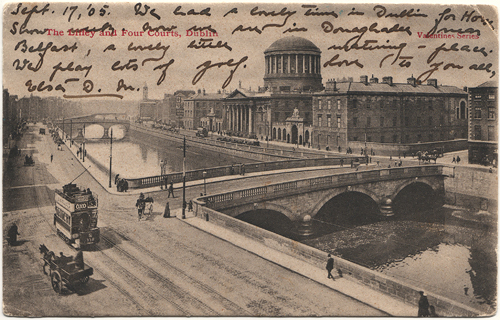 I wrote about the daytime version of this Dublin scene in an earlier post on the pre-1907 phenomenon of writing messages on the front of postcards. The same photograph was altered by the publishers for use in the ‘Valentine Moonlight Series.’ The addition of a full moon; a reduction in the traffic and the depopulated street transform the original scene into a quieter nocturnal world. Valentine and Sons were one of the main producers of postcards at the turn of the nineteenth century and I wrote an entry on their extensive business for John Hannavy’s Encyclopedia of Nineteenth Century Photography. The message on the 1904 postcard is a fascinating snippet of life. Apparently the person sending the postcard has been inconvenienced by the death of an uncle and may not now be able to go on a proposed outing with Miss Brenton! The monument, which is just visible in the background of this 1950s snapshot, allowed me to pinpoint the photograph’s exact location as being on Hawkins Street. The gothic revival and Celtic monument was erected ca.1906 to commemorate a Dublin Metropolitan Police Constable, Patrick Sheahan, who lost his life in the line of duty. The group stand at the rere of the faux-tudor Gas Company headquarters which was designed by Robinson Keefe. You can see some detailed photographs of it here. This photograph was rescued from a skip by my good friend, Garry O’Neill, and features in his long awaited book on decades of Dublin street style entitled Where were you? It was published and designed by Niall McCormack of HiTone and will be launched tomorrow in the Gallery of Photography, Meeting House Square, Temple Bar. On another note, I was delighted to be asked by the excellent Irish history blog Pue’s Occurrences to review a new photography book. Revolution: a photographic history of revolutionary Ireland, 1913-1923 includes some rarely seen images from private and public collections. I also wrote a little piece for Stacy Waldman’s blog House of Mirth on my favourite Halloween photograph. Stacy’s gathered together some really amazing photographs from collectors and fans of vernacular photography including Barbara Levine, Ron Slattery and Robert E. Jackson. As if this wasn’t enough photography related activity, I went to Après Paris at the Sugar Club last Thursday. This event was organised by PhotoIreland festival and featured up-dates on Paris Photo and talk of next year’s PhotoIreland festival which I am already looking forward to! Before 1907, if you were sending a postcard to the United States you couldn’t write anything other than the address on the back of the card. As a result of this people wrote their messages around the image and this led to an interesting and quirky intersection of words and pictures. The pattern created by the text against the image is often fascinating. The sender of the first postcard from Howth/Beann Eadair has managed to write a considerable amount of text over the sea and sky! It was sent to California in April 1905. The second card was sent to Boston in 1905 and mentions a trip to the Dublin Horse Show and Donaghadee, near Belfast. 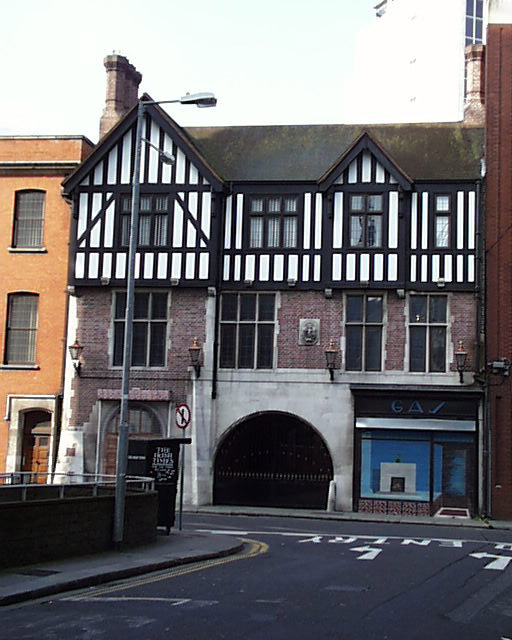 Private Wine Rooms over mystery Dublin pub? This snapshot is crammed full of amazing details like the sign for ‘private wine rooms upstairs’; the young fella peaking over the odd little car; the banner advertising Player’s cigarettes and the shadowy sign in the window. Despite my loathing of Arthur’s Day I am still fond of the ‘Guinness is good for you’ sign. This photograph has me totally puzzled though as I cannot locate a Dublin pub whose street number is 32 and which is also next door to a stationer’s/tobacconist’s. The name of the shop looks like Hegarty and in the original print I can faintly make out a surname ending in ‘lly’ on the etched pub sign. I have checked one or two Thom’s Street directories for the 1920s, 30s and 40s but to no avail. Perhaps the photograph wasn’t taken in Dublin which would disappoint me though it really shouldn’t matter as the image is a great snippet of street life wherever it originates. Any suggestions welcome? This pair of cartes de visite typify the type of inexpensive studio portrait produced in the 1860s and 70s. They are remarkably similar even though they were taken by two different studios on Westmoreland Street, Dublin. The crude tinting blurred the individual features and produces a mask-like appearance. Only the painted backdrop and furniture styles differentiate the studios from each other. Despite the claims of excellence made by both studios, they display a standardisation of pose that the format’s detractors frequently pointed out. The craze for these inexpensive portraits reached its peak on the 1860s and this is reflected by the sheer number of studios on three of the main streets of the capital: Sackville Street (now O’Connell Street); Westmoreland Street and Grafton Street. This strip became known as ‘The photographic mile’ and at one time boasted over 60 studios. The man with the tinted cheeks was taken by Forster’s who were according to an 1868 advertisement situated on the ‘drawing room’ floor of 30 Westmoreland Street. Access was through the front door of the New Medical Hall. Forster entered into several partnerships – in March 1862 he was in business with Mr. A.J. Scott, however, by February 16th, 1864 he was working alongside T.F. Haskoll. This partnership was in turn dissolved by 1864 when Haskoll set up on his studio own at 118 Grafton Street. The United Provinces of Ivanlandia!